Dervishes is a Sufi order. 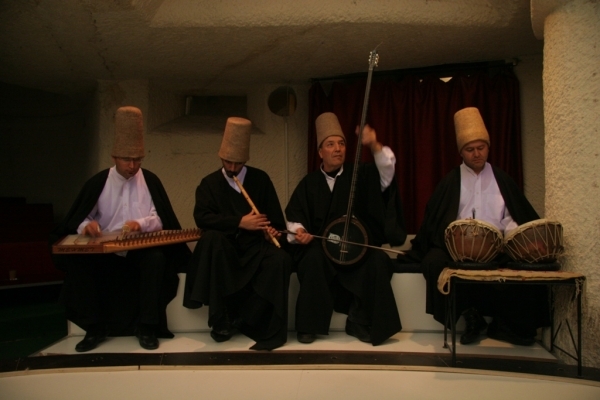 Sufi means those first ascetic communities of Islam which abandoned the mundane, advocating that human destiny depends on the inscrutable will of God. In these communities initially prevailed ascetic element of mysticism, while over time asceticism was seen as a preliminary step to achieve the spiritual life. The mysticism took the position of asceticism as an objective pursuit. The Sufi communities directly affected by the oldest traditions and philosophies of East and Mediterranean basin, like Neoplatonism, Gnosticism, Buddhism and Christianity. All these teachings played a role in the final shaping of Sufi teaching, since according to them sufi ”all traditions lead to a single truth “! 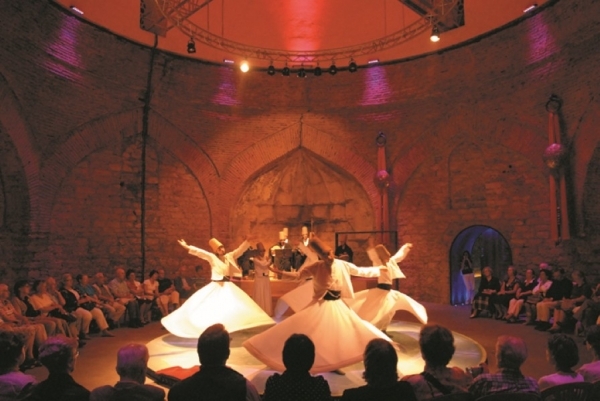 The Whirling Dervishes played a vitally important part in the evolution of Ottoman high culture. From the 14th to the 20th century , their impact on classical poetry, calligraphy, and the visual arts was profound, while music was perhaps their greatest achievement! 5. 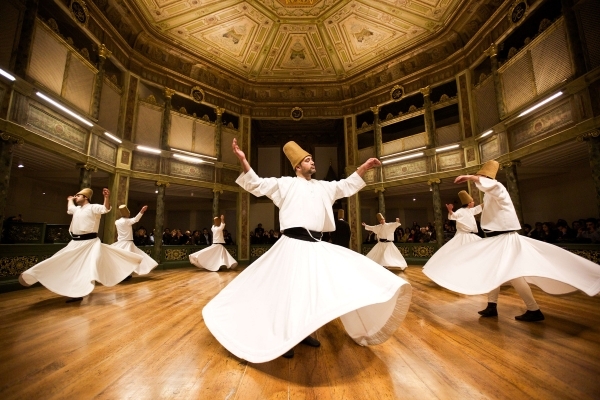 Whirling: The dervishes drop their black cloaks to reveal white costumes with long, flowing skirts. The dropping of the cloak symbolizes the casting off of falsehood and the revelation of truth. 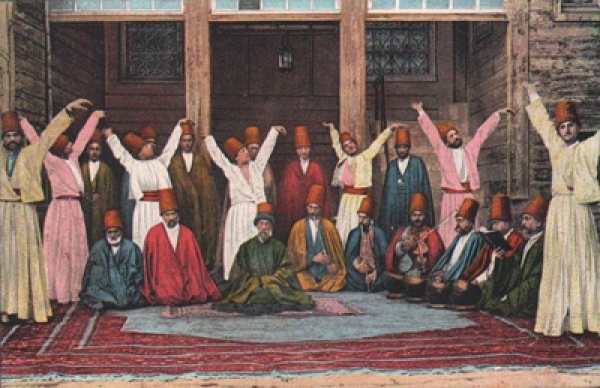 Each dervish places his arms on his chest to symbolize his belief in the Oneness of God, “the One.” Bowing, he kisses the hand of the Sheikh Efendi (spiritual leader) and seeks permission to enter the sema. As he enters, each dervish slowly unfurls his arms, his right hand reaching up to heaven to receive its blessings, the left hand down to communicate them to earth. He whirls right to left, with his heart at the axis of the turn. The dervishes complete four whirling sessions of approximately 15 minutes each, resting briefly between sessions. The Sheikh Efendi joins in the final session, turning slowly. 7. Fatiha: Recitation of the Fatiha, or first chapter of the Kur’an, in memory of all prophets, martyrs and believers, followed by a prayer for the welfare of the nation and its leaders. -The Hodjapasha dance theater offers great atmosphere for this Show. Located near Sirkeci station. Istanbul Airport Shuttle How to meet at Ataturk airport Ataturk Airport-Lost and Found Sultanahmet Transfer How to get from cruise ports to the city? How to get from Ataturk airport to the city? How to meet at Sabiha Airport Is there any additional charge for my airport transfer service? Istanbul Airport Transfer What time should I leave my hotel to catch a flight in Sabiha airport?